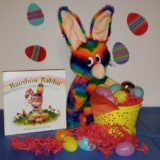 VIDEO: Rainbow Rabbit visits Holy Angels School on SNJ Today! Joe Vallee, Executive Director of Rainbow Rabbit Educational Services Corp., spoke with SNJ Today about what makes Rainbow Rabbit so unique. RELATED: Rainbow Rabbit Expands its School Programs! Yvette Verticelli, a preschool teacher at Holy Angels, recalls the joy she experienced while watching her students learn Rainbow Rabbit’s story, and how lessons of kindness must be taught early. For more information on Rainbow Rabbit’s school presentations, click here.